Positive behaviors is what we practice here at all of our Eleva-Strum Schools. We teach the students what is expected to help them understand what it looks like to be Responsible, Respectful and Safe. These activities are called Teach-Tos. We do our best to give the students all of the information that they need to make good choices and to model what has been taught to them. 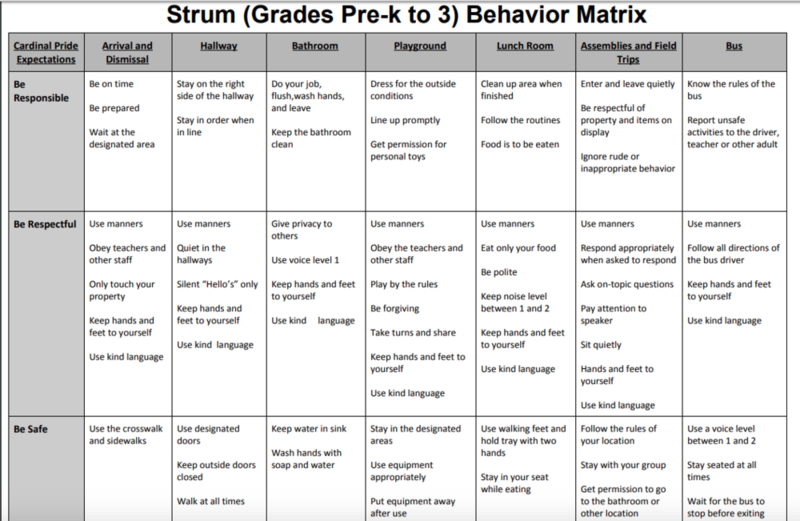 We have provided an image (above) of the behavior matrix we use to help you understand the expectations that we have and that your children have been taught about. This is a gradual process and this week we are focusing on Being Safe. At our Friday morning meeting Mrs. Maki had some help from her students in teaching us how to be safe in the hallway. The test for you is to view the video clips and see if you can identify the safe way to walk down a hall at the Strum Elementary School.